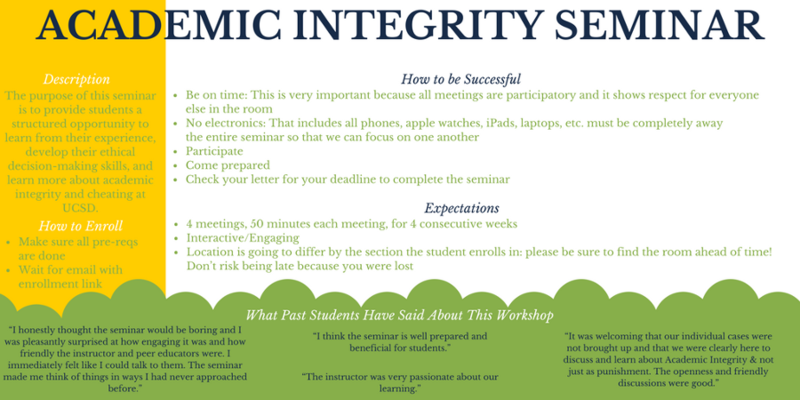 The purpose of the AI Seminar is to provide students a structured opportunity to learn from their experience, develop their ethical decision-making skills, and learn more about academic integrity and cheating at UCSD. out-of-class assignments, allowing students time for reflection and learning. Trained Peer Educators, along with the seminar instructor, will work with students in seminar. Peer Educators will be available to work one-on-one with students throughout the seminar experience according to the student’s individual needs and requests. In order for the seminar process to function well, the following rules and expectations must be respected and observed by all students, Peer Educators, and Instructors. Punctuality. Respecting time boundaries is a key component of this seminar process. As meeting times are limited and schedules are precisely planned to maximize learning opportunities, it is expected that you be on time to all meetings. No cell phones, laptops, or other communication devices should be on during seminar or one-on-one meetings. Staying present to other individuals and/or groups without external distraction is fundamental to ensuring that all members have the opportunity to learn from one another. Confidentiality. Although individuals are not obligated to share personal information about themselves or their violation, the seminar is designed as a safe space wherein individuals can feel free to discuss information that is considered personal and/or private. Thus, by participating in this seminar, you may learn confidential and personal information about other students. Communicating such information in any way that it may be attributed to an individual is not permitted. However, you should feel free to share what you learn or insights you’ve gained. Participation and Respect. All individuals, including students and the instructional team, have experiences and opinions that enrich learning in the seminar process. Each individual’s participation may vary; you are expected to participate as works for you in the seminar process through small group discussions, large group discussions, and one-on-one meetings. The goal is not to speak for the sake of speaking, but rather to enrich the learning process through consistent participation. You will find that if you are open to participation, you will feel activated to discuss various topics at various times in an instinctive manner. Participation also relies on the expectation of respect for others ideas, opinions, and values. Such respect may come in the form of sharing time in discussions for all individuals to speak, as well as listening and learning from differing viewpoints. Meeting Deadlines. Seminar assignments are designed with the intent of reaching specific learning outcomes, wherein deadlines are set at key points within the seminar process. Time management and meeting all deadlines is required. If for any reason, you cannot meet a deadline, please contact the instructor immediately. After you complete all of the AI Training Universal Pre-Requisites, you should receive an email with the different seminar sections. If you do not receive this email within two business days, contact aio@ucsd.edu letting us know you have completed the pre-requisites. Make sure to include your name and PID. You will not be able to enroll in a seminar section until you have completed the AI Training Universal Pre-Requisites. NOTE: when choosing your Seminar section, make sure the first meeting of the section occurs AFTER your scheduled 1:1 Universal Pre-Requisite meeting. For exact date and time see the seminar schedule (on TritonEd) for your section. You are not required to bring any materials to your first section meeting. However, make sure you are familiar with the Expectation and Standards (Step 2), especially make sure to arrive ON TIME. Make sure to bring the handouts that were distributed during Meeting #1 to Meeting #2. Get familiar with them as they will be discussed in this section. This assignment offers you the opportunity to explore the ethical decision-making process through considering the dynamics of a current ethical dilemma that you are facing. The DRAFT is due at our third seminar meeting (For exact date and time see the seminar schedule for your section). Instructions are below. The FINAL is due one week after your final Seminar meeting (for exact date, see Schedule & Deadlines document) Instructions are below. Your DRAFT is due at the third Seminar meeting. You must have 2 copies of your assignment PRINTED OUT. It is ok to use notes and bullet points, but you must express complete thoughts. The important thing is to work through all of the information in a way that others can understand. Include details and fully answer ALL parts of the assignment. Think of 2 or 3 ethical dilemmas you are currently involved in (this is not about your integrity violation!). An ethical dilemma is a conflict between two (or more) “rights” (e.g. honesty, trust, responsibility, respect, comfort, security, happiness, freedom) or two “interests” (e.g., self versus community; you versus me; personal versus professional). We all face multiple ethical dilemmas throughout our lives and there is no doubt that you are facing some right now! These may be short, immediate issues, or on-going, spread over years. They may be small or large. If you are having trouble coming up with something, schedule a preliminary meeting with a peer educator to talk about ideas for you to write about. The situation you choose should be one that is not easy to work through. You should not be sure what to do. The point is to get consultation on what you should do---if it isn’t difficult, it wouldn’t be a dilemma and you wouldn’t need consultation. What are the contributing factors that lead up to the situation? Step 3: Describe each ethical dilemma. Why is it an ethical dilemma? Identify and discuss any conflicting interests, values, and/or principles involved. How would a caring and reasonable person respond to this situation? What are your feelings when in this situation? Discuss any rules or behavioral standards that could be violated by taking one action or another. Step 4: List possible options for resolving your ethical dilemmas. Think up as many choices for action that could reasonably work to resolve each situation. Step 5: Choose ONLY ONE of the situations you have written about to focus on for the remainder of your paper. Note: be sure that the situation you are choosing is a current dilemma involving you, where you are conflicted between multiple right options and there is not a clear right answer. Step 6: List the questions you want to ask that may help you navigate the ethical dilemma you chose in Step 5. What would help you clarify the situation? What issues would you like input on? Think beyond questions such as “what should I do?” they often serve to limit discussion. Rather, focus on questions that serve to uncover new perspectives and ways of navigating your dilemma (e.g. Do I have any “blind spots” when discussing this dilemma? What does this dilemma uncover about my values/perspective? Etc.). In order to prepare for an effective consultation, write down at least 5 questions. During the seminar, your peer educator and group will help you think through your cases, answer your questions, and develop your ideas. This process will help you think more clearly and carefully about your situation and revise your draft. What would the possible consequences, both positive and negative, be and who might they impact? What values would this choice likely undermine or uphold? (E.g. honesty, trustworthiness, respect, responsibility, or fairness) How would these values be upheld or undermined? What rules, standards, codes of ethics, policies, and/or guidelines would the “right” choice uphold or violate? Step 8: Identify and discuss the “right” course of action that you will take. Reflect on and discuss what thoughts, interactions, and learnings have led you to your “right” course of action. Why do you believe it is the best option? Describe what frustrations, challenges, or obstacles you foresee in choosing the “right” course of action. What actions can you take to mitigate them? What reasons/motivations do you have for choosing the “right” course of action despite such obstacles? Step 9: Bring 2 hard copies of this DRAFT to our 3rd seminar meeting (for exact date and time see the seminar schedule for your section). Step 10: Revise your Draft. You will be discussing your assignment draft in our third seminar meeting. It is your responsibility to use that opportunity to get all the feedback you would like on your dilemma and your assignment. You must then revise your assignment and submit the final product. Your ethical dilemma assignment must be submitted through TritonEd no later than 11:59pm one week after your final seminar meeting. If you have any concerns about your ability to meet this deadline, you must request an extension. The final of this assignment is to be submitted through TritonEd on the course page for the AI Seminar. Find the link in the folder for your section. Your final assignment must be uploaded by one week after your final seminar meeting. For exact due date, see Schedule & Deadlines document posted on TritionEd. This assignment does not have to be completely narrated. Some steps are better expressed as bullet points (e.g., step 4 & 5) and you may keep them as such in your final draft. There is no maximum page limit for your case analysis, but if you wrote it in essay form, we suspect it will take you at least 2 pages, double-spaced, times new roman font (12) to accomplish the learning objectives. If you use bullet points, your assignment may be longer. You must upload your revised assignment to TritionEd by 11:59pm one week after our final meeting. Johnson, C.E. (2007). Ethics in the workplace: Tools and tactics for organizational transformation. Thousand Oaks: Sage. Kidder, R. (1995). How good people make tough decisions: Resolving the dilemmas of ethical living. NY: Simon & Schuster. Bring 2 hard copies of this DRAFT to our 3rd seminar meeting (for exact date and time see the seminar schedule for your section). During the seminar, your peer educator and your discussion group will help you to think through your cases, answer your questions, and develop your ideas. This process will help you to decide which dilemma to write about and also help you to think more clearly and carefully about your situation. This assignment offers you the opportunity to explore your personal strengths and weaknesses, consider which obstacles present the more significant challenges to you choosing to do the right thing, and to begin to develop a concrete plan for moving forward toward taking more ethical actions generally. You can use bullet point or lists in your assignment; you do not have to write everything in full essay form. However, you will need to express your thoughts fully and completely. In writing this assignment, imagine you are being asked these questions by someone interviewing you for a job, grad school, or similar (Hint: questions similar to these come up in interviews often!) Craft your answers in a careful, honest, and detailed manner! You MUST bring TWO PRINTED copies of your assignment to our fourth seminar meeting. Submit your revised assignment through TritonEd by 11:59pm one week after our final seminar meeting. For exact due date, see Schedule & Deadlines document posted on TritionEd. Your DRAFT is due at the fourth Seminar meeting. Step 1: Identify and discuss 2 strengths that you have that relate to ethical decision-making and academic/professional integrity. For each strength, describe any foreseeable scenarios in which you plan to use your strength to uphold professional integrity. Step 2: Identify and discuss 2 weaknesses that you have that relate to ethical decision-making and academic/professional integrity. Describe any foreseeable scenarios in which your weakness may contribute to preventing you from upholding professional integrity. Identify and discuss at least one specific action that you plan to take to improve upon your weakness. For each action identified, how do you plan to measure/assess your improvement? Step 3: What frustrations, challenges, or obstacles do you foresee that you could prevent you from upholding professional integrity in the future? What specific motivation(s) do you have for doing your professional work with integrity even if presented with the opportunity to act unethically? Step 4: Discuss what professional integrity means to you. What are 2 things that you can do to help spread a culture of professional integrity? You MUST bring 2 printed copies to our fourth seminar meeting. You must upload your revised assignment to TritionEd by 11:59pm one week after our final meeting. Bring 2 printed copies of your Personal Ethical Decision Action Plan Draft to your 4th seminar meeting (For exact date and time see the seminar schedule (on TritonEd) for your section). to practice writing and talking about your academic integrity violation for such things as graduate and professional school applications. Includes what you have learned as a result of the violation and participation in the AI Seminar and relate those learnings to your future (i.e., how it will make you a better doctor, dentist, accountant, or your profession of choice). Articulates how your experience can actually benefit the employer/school to which you are applying (i.e., how will what you learned from this experience help your future school and/or profession? ; what will your specific contribution be?). Note: While you can’t predict the future, it is recommended that you continue to write as concretely as possible. It may help to think of examples of the most likely ways that your experience will assist your contributions to future academic and professional communities. The Seminar Instructor will give you feedback should you ever want to actually modify this essay for use in the future. FINAL NOTES: In order for you to facilitate your meeting of the specified learning objectives, the final submission of this Essay would have to be at least 500 words (much longer than an actual application essay might be), but you use as many words as you need to use to convey your learnings and yourself in a convincing and compelling way. Because much of the learning happens during the meetings, timeliness & attendance at the Seminar meetings is mandatory! If you enroll in the seminar but do not show or arrive late to the Section Meetings or One-on-One Meetings, you will FAIL Seminar. It is YOUR RESPONSIBILITY to take note of your meeting dates, times and locations (NOTE: responsibility is one of the five fundamental values of academic integrity). If you cannot meet these responsibilities, you must contact the AI Office or AI Seminar Instructor to communicate what is going on. Because learning occurs through the assignments and assessments, timely completion of them is mandatory! If you fail to submit any assignments or assessments by the deadline, you will FAIL Seminar. It is YOUR RESPONSIBILITY to download the Seminar syllabus from TritonED, take note of when assignments and assessments are due and submit them on time. If you cannot meet these responsibilities, you must contact the AI Office or AI Seminar Instructor to communicate what is going on. There are only two grades for this seminar--- Pass or Fail. PASS: complete the prerequisites, attend all seminar meetings on time, submit all assignments by the deadline and with clear thought and engagement, participate in the seminar activities and discussions, and meet all outlined seminar expectations, standards and policies. FAIL: failure to do any of the above. If you fail, $50 will be charged to your student account and additional sanctions may be imposed. click here to get the flyer for seminars!